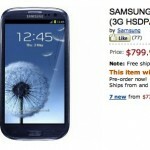 If your budding rap career has just started taking off, and you feel like the Samsung Galaxy S3 would look rather nice atop Amber Rose covered in a pile of your own money, you may be interested to know that the GS3 is currently available for pre-order on Amazon for the low price of.. $800. We’ve seen the device pop up on Amazon before, but that was back when it was up for pre-order in Europe, this marking the first time it’s been available for calling dibs here in the states. This particular model is available unlocked in either blue or white with 16GB of internal storage and a complete lack of US supported LTE bands. But you know what that means? Yup, you guessed it. The much sought after quad-core Exynos processor will come inside. If AT&T’s HSPA+ network is all the data speeds you’ll need (or T-Mobile’s Edge), hit up the source link and get to pre-ordering. The 3rd party retailer lists June 1st as the expected ship date, but admits that it’s nowhere near final. Just take it as a rough guesstimation.